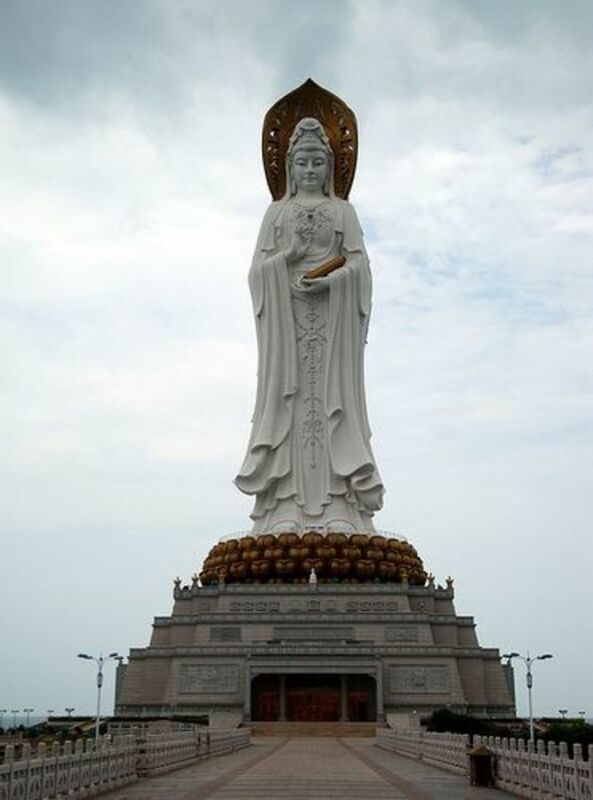 There are several ways to spell the Chinese name of this Buddhist Diety: Kuan Yin, Guan Yin, Guanyin, Kwan Yin, Guan Yen. She has other names in other languages. I remember the first time I encountered an image of Kuan Yin. It was many years ago, before I had heard the name of Kuan Yin, I walked through a doorway in the Museum and felt this much larger than life Kuan Yin (see the photo) gazing down at me and it took my breath away. I sat down on the wooden bench in front of her for some length of time, not wanting to leave this enchanted presence. I watched as people came into the room and saw them experience the same reverence that I had at once felt. Even small children hushed their chatter as they entered her presence and could not take their eyes away from her. In the following years, I have returned to this place of magic many times. It never loses it's enchantment. Among Buddhist statues exhibited in the Nelson-Atkins Museum of Art in Kansas City, Missouri, is this 11th/12th-century C.E. 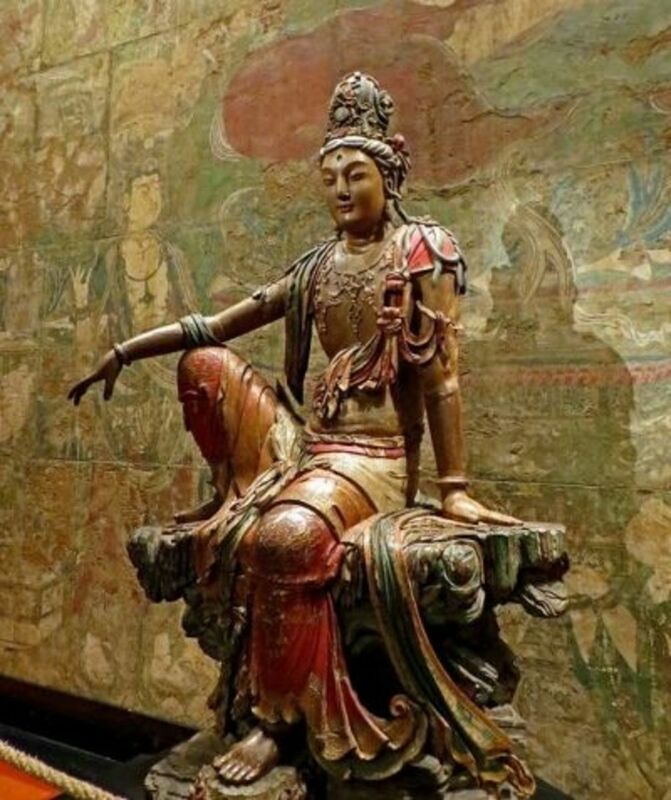 polychrome wooden Avalokiteshvara, Seated Gaunyin Bodhisattva, internationally heralded as the finest sculpture of its kind outside China. Connect with the ancient power of the Goddess in you life. This book introduces Kuan Yin to Western readers, and reveals that Kuan Yin is the mystery and power of the divine feminine, who transcends all doctrines, creeds, and traditions. It cover the origins and evolution of Kuan Yin in early China, Buddhism, Taoism, and shamanism, and includes the myths and stories about Kuan Yin and poetry. Guanyin of the Southern Sea also called Nanhai Guanyin. 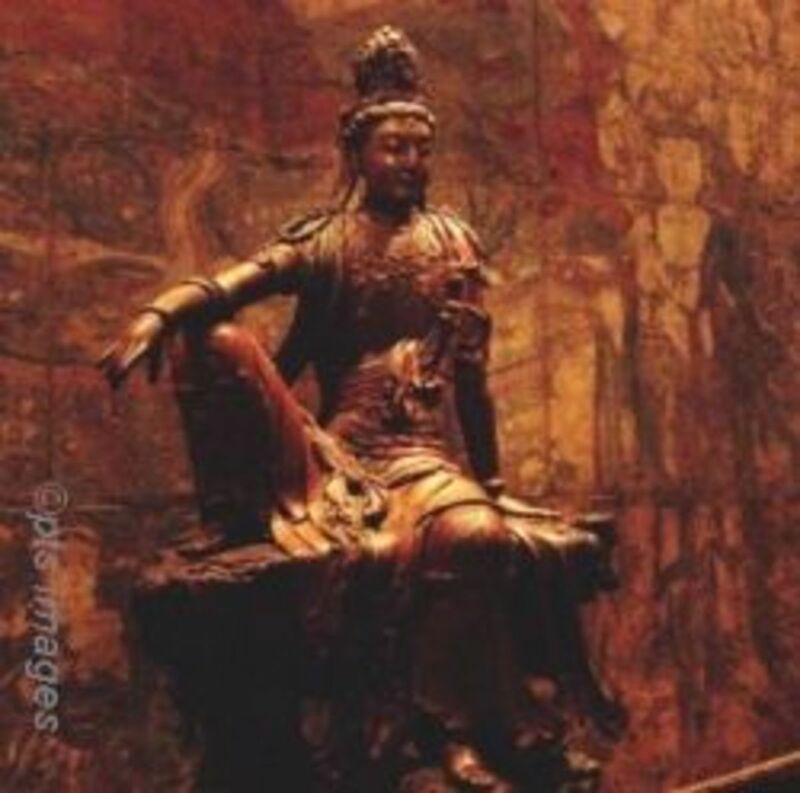 "The Bodhisattva Guanyin, [Kuan Yen, Kwan Yin] the Chinese Buddhist deity of compassion and mercy," in the above photo "is seated in the posture of royal ease on a simulated outcropping of craggy, perforated rock." "The position of the Guanyin, one leg in pendant, conveys the impression that the Bodhisavatta might at any moment rise from a state of deep contemplation and step down from the carved lotus rest." The Bodhisavatta's "worldly ornaments, such as the high tiara and rich necklaces in sumptuous detail, contrast with the more plain image of the Buddha, whose markings indicate his ethereal status. 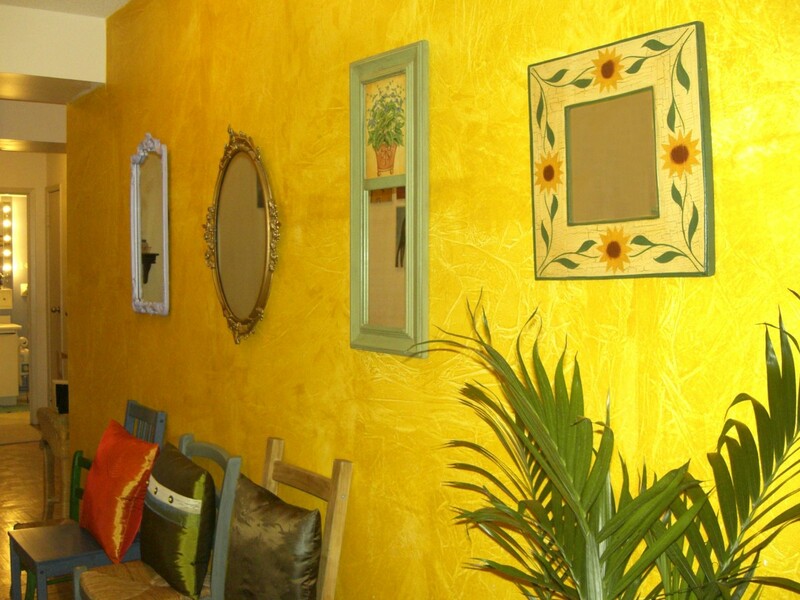 The soft skin and contour, charm of bearing and beguiling smile create an aura of femininity." What is a bodhisattva? The bodhisattva, a popular subject in Buddhist art, is someone who does spiritual practice with the goal of achieving full enlightenment, but who who is still subject to birth, illness, death, sorrow, defilement, and delusion. Just before arriving at the point of enlightment, she turns back into the world and says, "No, I will not achieve liberation until all beings have been set free." Then she steps into the world and works to alleviate suffering and to awaken beings to their true nature. "A bodhisattva is one who has a determination to free sentient beings from samsara and its cycle of death, rebirth and suffering. This type of mind is known as the mind of awakening"
The concept of the Shuiyue Guanyin arose from the eminent Tang poet Bai Juyi's poem "Ode to the portrait of Shuiyue Guanyin" expressing his devotion for the "Moon's reflection in Water form of Guanyin" (Shuiyue Guanyin). As if hiding In the white light. When I set my sight All egos are vanishing. Your disciple Bai Juyi With devotion under your feet. You are my cynosure Life after life forever. She is, first of all, the pre-eminent goddess in all of Asia. You find her in China, Korea, Japan, Vietnam, Burma, Thailand and other countries. Then, in the Buddhist tradition, she is the Celestial Bodhisattva of Compassion. One of the most interesting elements of Kwan Yin's story is how she transformed from a male figure into a female one. 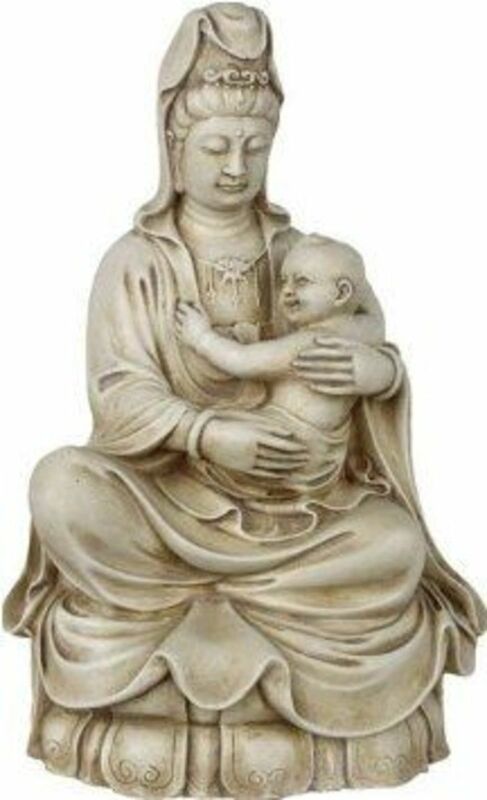 She was brought to China in the fifth century as the male bodhisattva Avalokitesvara; in the next three hundred years she mysteriously transformed into the female Guan Shih Yin or Kwan Yin. How did that happen! Well, she came into the world embodied in actual flesh-and-blood women. There would be a child who was particularly kind and sweetly accepting, she would grow into a compassionate woman who did many good deeds for others; sometimes she would even sacrifice her life to save others. Then, after her death, through various magical signs, it would be understood that this had not been an ordinary woman but was a sacred being, the goddess Kwan Yin. Many stories in China relate this history, and that is why there are so many different forms of the Chinese Kwan Yin or Guan Shih Yin. This lovely, illustrated volume recounts the stories of this bodhisattva, explains Kwan Yin's role in Buddhism and includes meditations, chants, and prayers. What is your interest in Kuan Yin? Actually, anyone can be like Kuan Yin. You may say that you don't have a thousand eyes or a thousand arms or that you lack skilful means, but it is your compassion that can transform you into a Kuan Yin. With your eyes and hands, you can help others. With your compassion, you can bring peace and tranquility to this world. Usually depicted glancing down symbolizing that Guan Yin continues to watch over the world. This antique and collectible Bodhisattva Quan Yin the Compassionate is very very old (1400-1450). Kuan Yin, the Bodhisattva of Compassion, is shown here in the aspect of Universal Mother. When a child plays on her lap, or children at her feet, they symbolize not only newborn and /or spiritual life, but also Mother Nature whose mysterious powers continually produce, sustain, destroy and renew life throughout the universe. 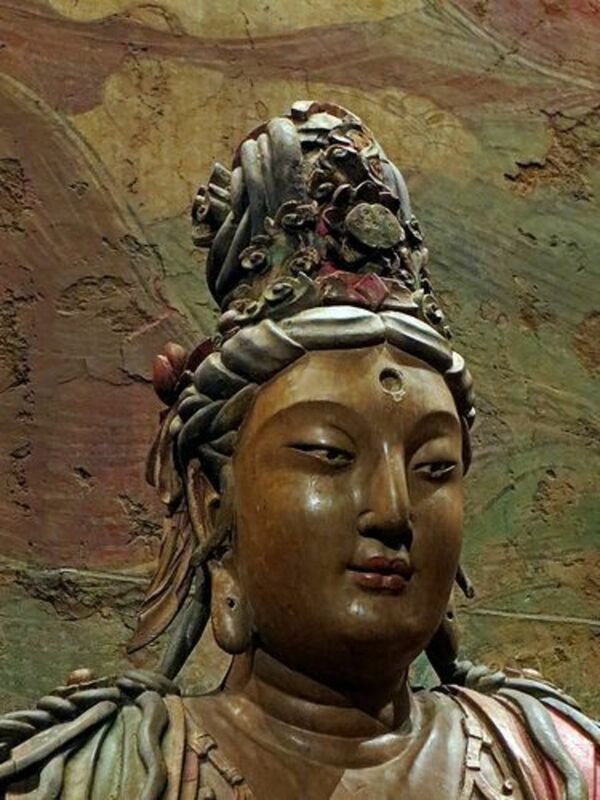 In China, Avalokiteshvara Bodhisattva is represented in female form and is known as Kuan Yin. Probably because of Kuan Yin's great compassion, a quality which is traditionally considered feminine, most of the bodhisattva's statues in China since the Tang Dynasty (A.D. 618 - 907) have appeared as female figures. In India, however, the bodhisattva is generally represented as a male figure. The Sanskrit name "Avalokiteshvara" means "the lord who looks upon the world with compassion". Translated into Chinese, the name is "Kuan Shih Yin"or Quan Yin. As long as you are kind and there is love in your heart A thousand hands will naturally come to your aid As long as you are kind and there is love in your heart You will reach out with a thousand hands to help others. In Buddhist art, "Avalokiteshvara Bodhisattva is sometimes shown with eleven heads, 1000 hands and eyes on the palms of each hand (Thousand-Armed Avalokiteshvara Bodhisattva). The thousand eyes allow the bodhisattva to see the sufferings of sentient beings, and the thousand hands allow her to reach out to help them. If any is carried away by a flood, call upon her name, they will immediately reach the shallows . . . or if anyone cries who is in deadly peril by the sword, the sword will be snapped asunder. 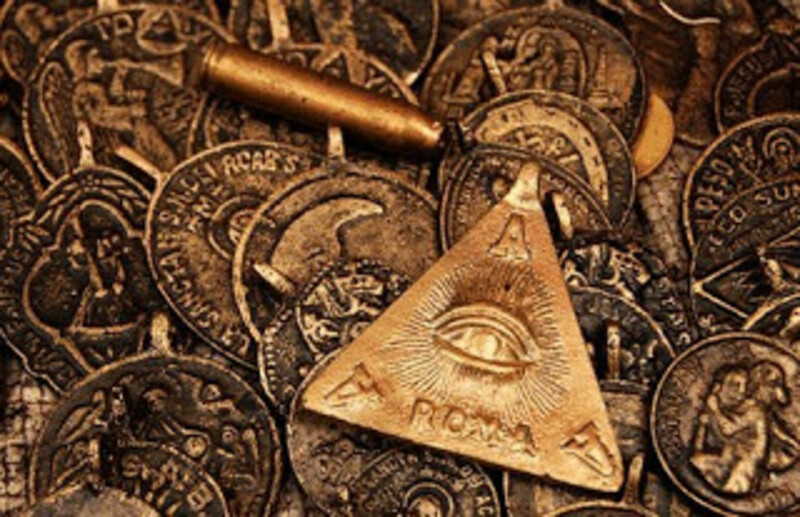 If wicked demons attach, the one who cries will become invisible to them ..."
- from the Lotus Sutra. The willow branch is used to heal people's illnesses or bring fulfillment to their requests. 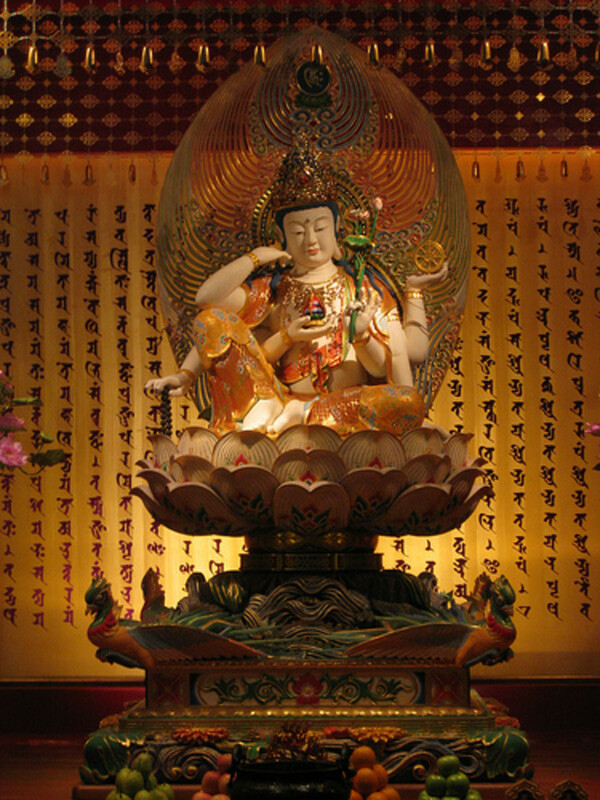 Kwan Yin also enjoys the wide popularity of a folk goddess. 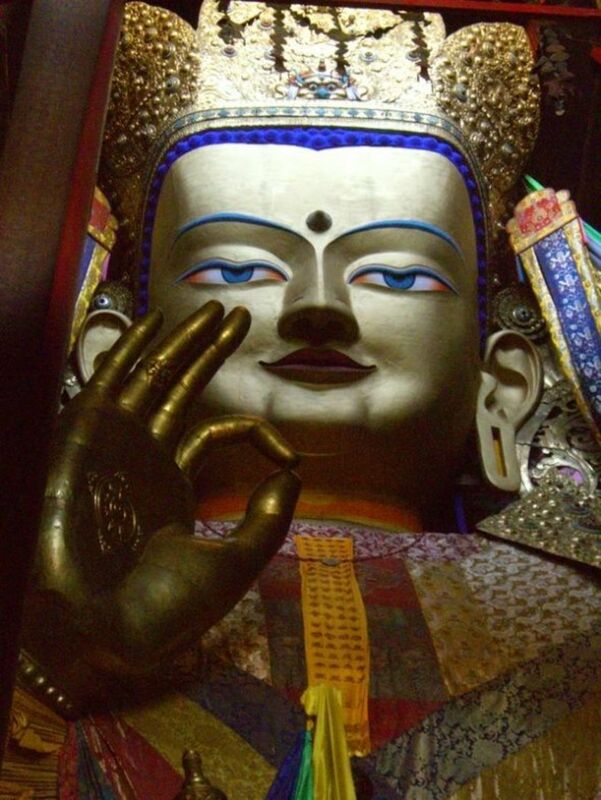 The people of Japan know her as Kannon and in Tibet the people pray to her a Chenrezi. 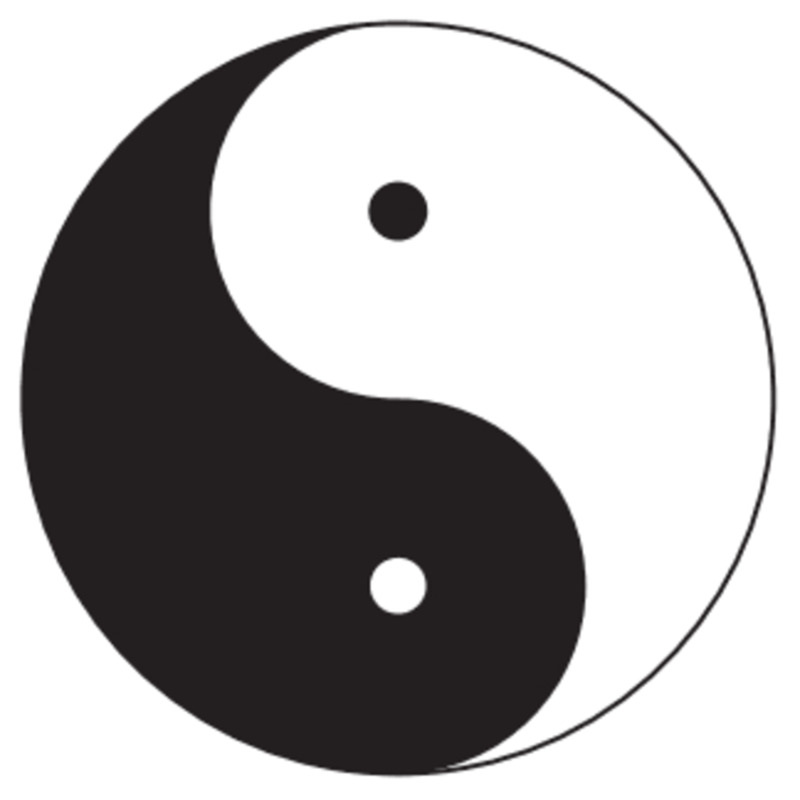 KUAN-YIN LINEAGE OF REIKI, Origins and Meaning. Thanks for adding to the info about Kuan Yin! Much appreciated! Kuan Yin hears my tears every day!!! Namaste!!! At our family house, we have statues of Kuan Yin on the altar for our ancestors. 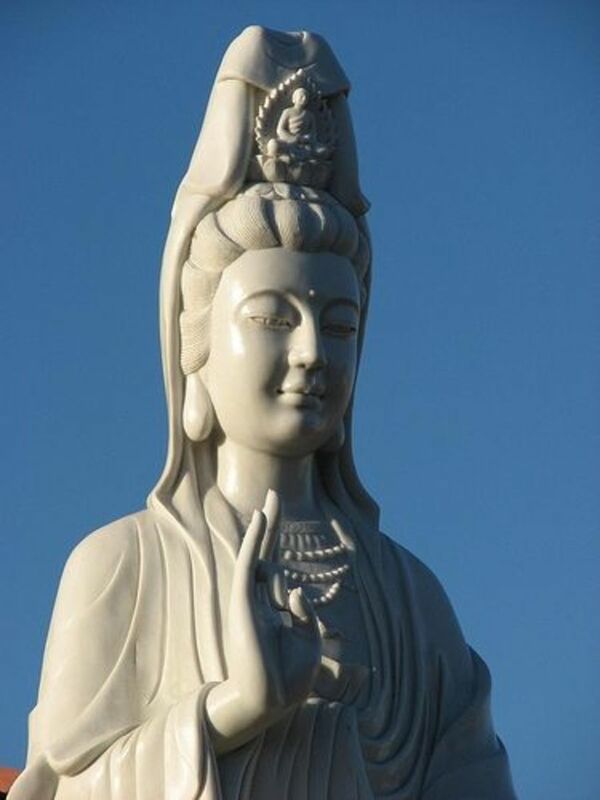 When I participated in group meditations at a healing center down South, I would sit next to the Kuan Yin statue. Her energy is beautiful and transcendent. You have done a great job detailing all I find fascinating about Quan Yin. Thank you for such a great Lense. Wonderful lens about Kuan Yin. *blessed*! I have to say that you have cover very on one of my favorite topic, thanks PatinC. Very beautiful lens - I love Kwan Yin. Thank you. This is a beautiful lens dedicated to a very special Goddess. Thank you for sharing these wonderful words and images. My mother and I have always liked having a statue of Kuan Yin in our homes. She brings so much serenity into our surroundings. Thanks for sharing this wonderful lens. Blessed by a SquidAngel. @Michey LM: Michey, Thank you for the Angel blessing! @SofiaMann: I haven't heard of Magnified Healing. Do you know Magnified Healing? It is said that Kuan Yin is the inspiration of this system of healing. Like the Kuan Yin pictures you used for this lens. 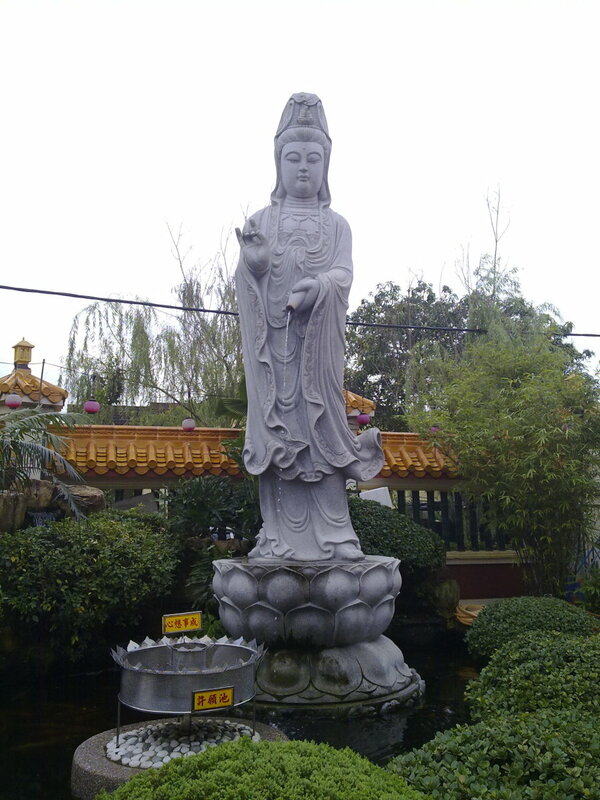 Very complete information about Kuan Yin. Thank you for featuring my image of the Guanyin Statue of Hainan on this wonderful lens. I am proud to have provided a contribution to this page. My family in Korea are long time Buddhists. As a matter of fact, every year on my grandparent's birthdays, we visit the temple behind which they are buried and honor them with fruits and cakes and kowtow to their photos in reverence. I do believe in many of Buddha's teachings but won't go as far as saying that I am a Buddhist myself. However, I found your opening paragraph quite vivid in its depiction of what you experienced. It made me want to feel the same. Wonderful lens. Beautiful work, full of interesting information. Five *'s and a Lensroll! What a delightful look at the Mother of Mercy! 5* It would be an honour to have this lens in the Goddess group http://www.squidoo.com/groups/goddess I do hope you will consider joining. Did you know that HH The Dalai Lama is one emmanation of Quan Yin? Nice job. He stands for wisdom and compassion also. Beautiful page. We're new here, but hope to add to our own lens as time goes by. Thank you and Goddess Bless! Namo Ta Che Ta Pei Kuan Shi Yin Phu Sa! A really wonderful lens. 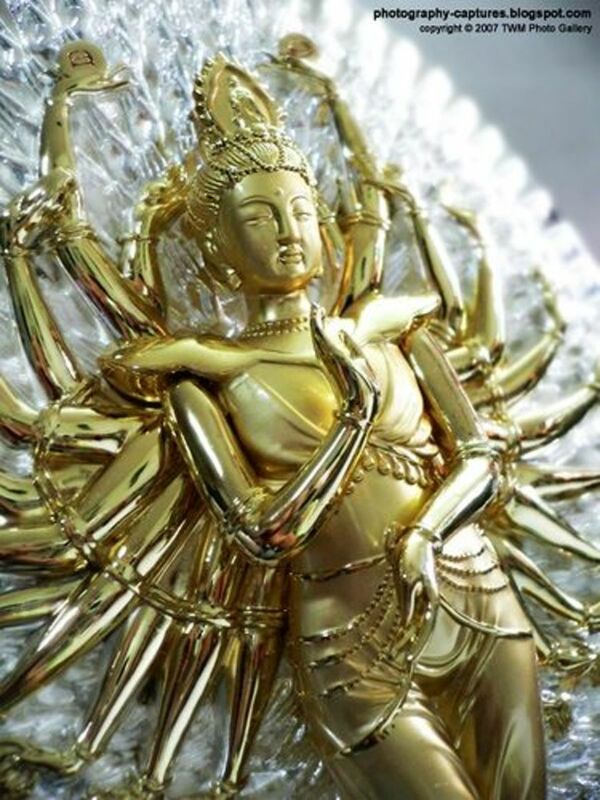 Thanks a lot for the great informations about Kuan Yin Bodhisattva. Fabulous lens! I love Kwan Yin!